"Ladies and gentlemen, the story you are about to hear is true." Radio's landmark police series pioneered new levels of realism on radio. 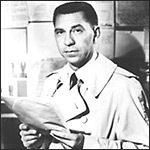 Every crime investigated by Jack Webb’s Sgt. Joe Friday was taken from the actual case files of the Los Angeles Police Department, with only the names changed "to protect the innocent." Like all policemen, Friday relied on the help, guidance and expertise of others on the force. He took his orders from Ed Backstrand, the Chief of Detectives (Raymond Burr), brought in pieces of evidence to be evaluated by Lt. Lee Jones of the crime lab, and counted on his partners to back him up. There were hundreds of sound effects in each broadcast, the actors used accurate police lingo, and the show didn’t shy away from stories that had unhappy endings. This interesting and innovative show provided, as Sergeant Friday might say, "just the facts."